The ancient synagogue at Chorazin has been partially reconstructed. 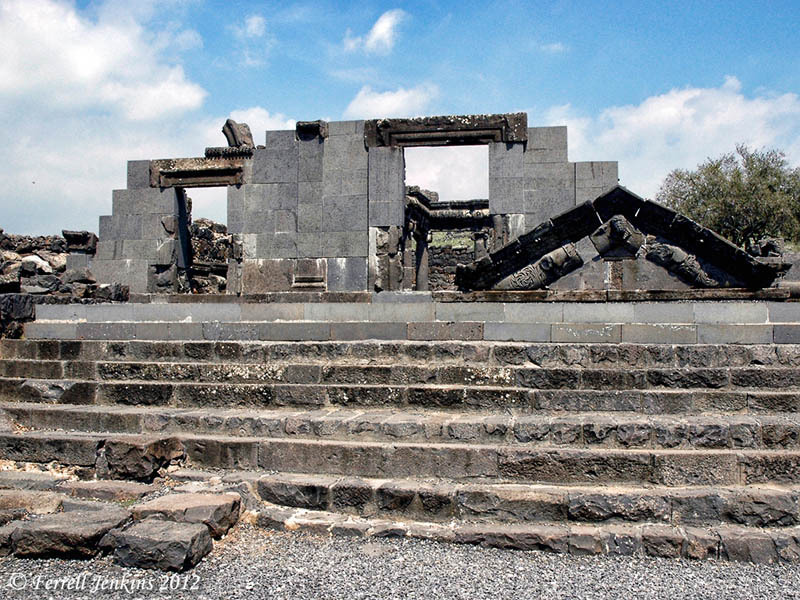 The structure is made of the local basalt (volcanic) stone that is found in the area. Restored Synagogue at Chorazin. Photo by Ferrell Jenkins. Scholars date the synagogue from the second century to the fourth century A.D. Ze’ev Yeivin, the director of archaeological excavations at Chorazin, is cautious in dating the synagogue. Thus far, I have said very little about dating—always a difficult and sensitive subject. The synagogue at Chorazin was first built at the end of the third century or the beginning of the fourth century A.D. Probably in the second half of the fourth century, the synagogue, as well as the rest of the town, was partially destroyed by an earthquake. The town apparently lay in ruins for some time thereafter. The Church father Eusebius, writing at the end of the fourth century, tells us that Chorazin was a destroyed village, apparently in fulfillment of the prediction in the Gospels of Matthew and Luke. (BAR 13:05 (Sep/Oct 1987). 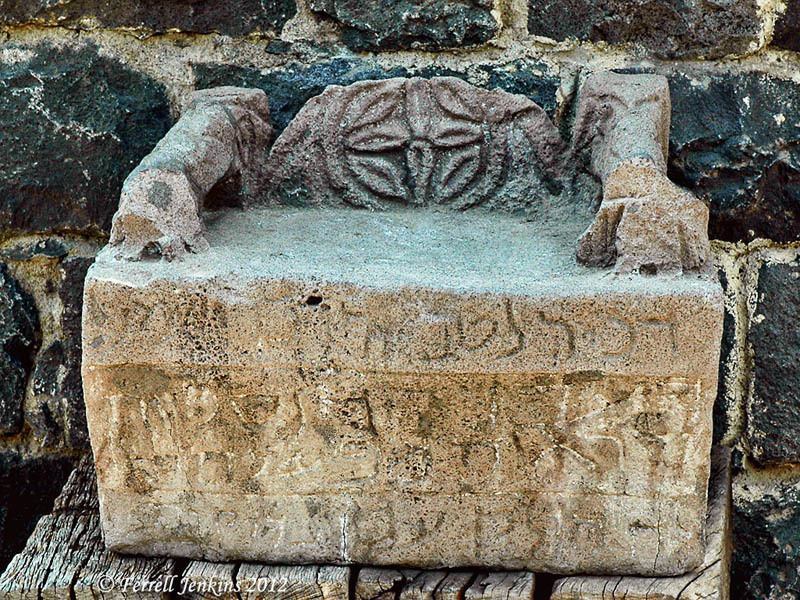 In 1926 a unique stone seat was found near the southern wall of the Chorazin synagogue. Since then it has been called the “Chair of Moses.” The Chair of Moses is a special seat that is used in some synagogues, even today, on certain occasions, usually located near the most important wall, that which faces Jerusalem. (BAR 13:05 (Sep/Oct 1987). The photo below is of a replica of the Chair (or Seat) of Moses. The original is displayed in the Israel Museum, Jerusalem. Replica of Chorazin Synagogue Chair. Photo by Ferrell Jenkins. It may be that Jesus had this type of seat in mind in Matthew 23:2. A parallel might be that we should listen to those who teach the Bible from the pulpit, but not follow their example when they do not live according to the Bible. The seating running around the inside walls of the building is typical of what we know from several synagogues. Chorazin Synagogue Seating. Photo by Ferrell Jenkins. James uses the Greek word sunagogue to describe the meeting place of early Christians. It is most commonly translated assembly. Whether our meeting place is elaborate or humble, we should not show partiality. 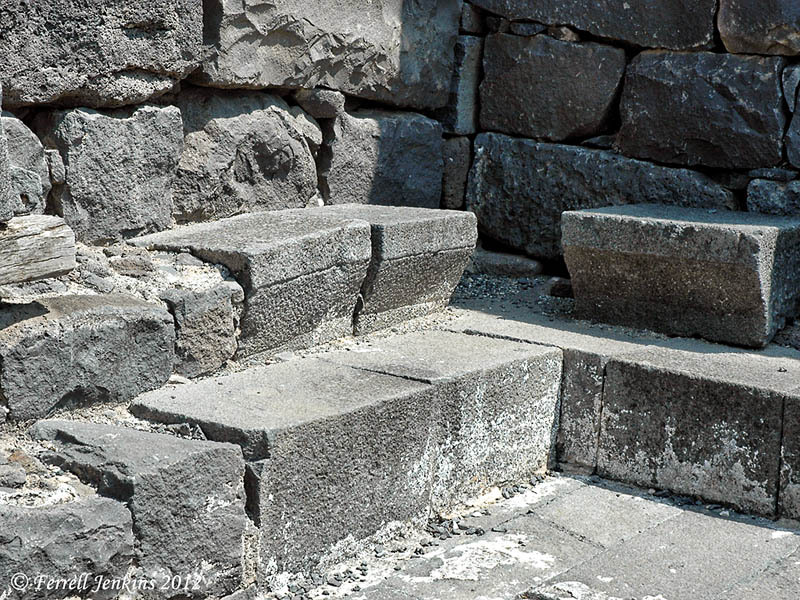 This entry was posted in Archaeology, Bible Places, Bible Study, Israel, New Testament, Photography, Travel and tagged Ministry of Jesus. Bookmark the permalink.